Mix well and let chill. So there’s really nothing I can say about dumpling pleating. To be quite honest, my first attempt a couple of years ago failed spectacularly, so I didn’t really have very high expectations. 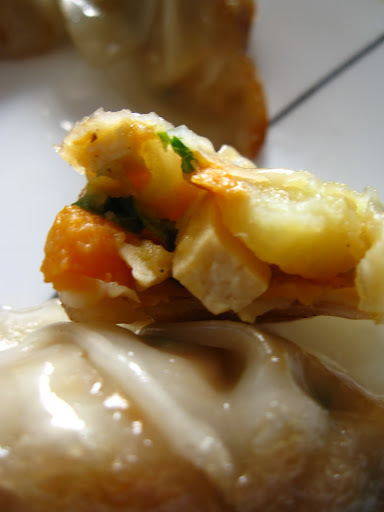 Here’s the thing – it will always be about the fillings – so who cares how fancy you fold or pleat your dumplings? Fold them over in a triangle for all I care! Do it ravioli style or just mush up the ends into a big ol’ knot. To each their own. I did a more traditional pleat (4 for veggie, 3 for meat) and I have to say – they turned out really well! I used the generic round dumpling wrappers (premade) and used water to seal. It doesn’t take too long – and if you have some nice background music on, you can easily sit there and wrap dozens! Which is exactly what I did – but now I have two giant freezer bags full of dumplings ready to go! Nutritious snack/meal success! Heat up a shallow pan/saute pan with about 1 1/2 tablespoons of oil on medium high. Lay about 8-10 dumplings in the pan. Let cook and sizzle for about a minute. Pour in 1/3 of a cup of water, cover the pan and reduce the heat to medium LOW. Let cook for about 10 minutes or until the water has evaporated. 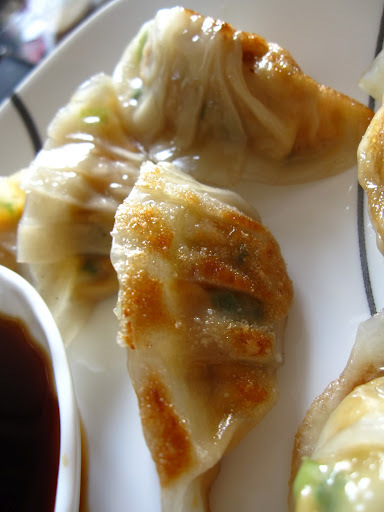 Once the water has evaporated, the dumplings should start sizzling and crackling – once that side has browned nicely, flip over and lightly brown another side (if you like – feel free to take them off the heat before flipping and eat) if you like for another minute or two. 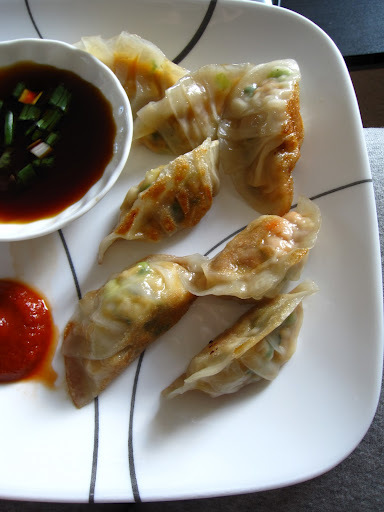 Serve with dipping sauce (equal amounts light soy and rice vinegar, 1 green onion chopped) and hot sauce.